For tabletop settings, however, metaplot becomes detrimental when ongoing official stories create a future for but not about the player characters. When the focus of the IP is an RPG game setting, secondary products such as novels should not be treated as setting canon (2). Mechanical changes for new editions should not be explained via metaplot. That’s how you end up with the Time of Troubles and the Spellplague, both unpopular, in the Forgotten Realms. It’s how you end up with a pile of setting “history” that intimidates new players and frustrates invested ones. Even the classic World of Darkness failed to withstand its own metaplot as sales dwindled toward the end of the line’s lifespan. 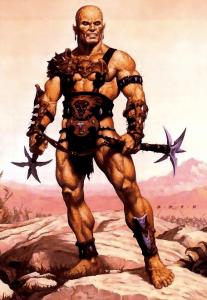 Rikus was a badass, but he shouldn’t have been doing cooler things than you could in Dark Sun adventures. Tabletop RPG players resist metaplot because they want their story to be central. Without knowing agreement from those players, metaplot feels like and is an intrusion. The damage is double if the metaplot has nonplayer characters doing the coolest stuff in the setting. A lot of readers of Dark Sun’s Prism Pentad novel series liked the story just fine. Almost none of those people liked the way that story collided with the early adventures in the Dark Sun RPG line, or the way the Prism Pentad precipitated a second edition of the campaign setting (3). Similarly, a lot of fans found the classic World of Darkness metaplot to be interesting fiction. However, trying to keep any of that canon true in an ongoing roleplaying campaign was tedious at best. Therefore, a lot of World of Darkness books were probably read more than played. It’s different if the storytelling for an IP isn’t just through an RPG setting, or if the RPG is an offshoot of an established story IP, such as The Lord of the Rings (4). When an IP is transmedia, with connected elements such as movies, comics, and video games, a metaplot can be essential. When a consumer lays down cash for a movie or video game, or the like that payout is buy-in to a preconstructed story. Further, consumers choose to interact with favorite story lines in various media because they come to rely on the consistency of those stories and their setting. Many fans enjoy the knowledge they build over time about the IP’s imaginary space (5). That sort of stability comes from a coherent metaplot. What if Return of the Jedi wasn’t the end? Well, here you have it. Or perhaps not. Many an IP has an extensive metaplot. Star Wars is one example. 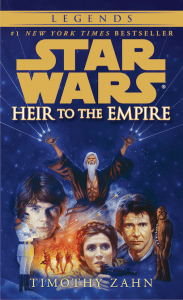 Audience engagement with the Star Wars metaplot is why some fans were less than happy when Disney decided to sideline the Expanded Universe (now Star Wars Legends). It’s similar with the Forgotten Realms novel metaplot and its treatment as RPG canon. Catastrophic events in the Realms fictional timeline, usually due to RPG needs, created system damage in both lines. Further, that harm diminished the perceived value of canonical expertise important to highly invested fans. A heavy-handed metaplot dealt similar injury to the classic World of Darkness line. These sorts of damage could have been mitigated with better IP management, acknowledging the needs of each fan base (fiction vs. RPG) were different. I’m not saying that metaplot for an IP that has multiple expressions, such as an RPG setting and novels and comics, can’t influence the RPG setting. However, careful management and acknowledgement of what the fans actually want has to occur, preferably in a data-driven manner. Novels and comics can be treated as what-if scenarios rather than canon (see 2 again). If the media outside the RPG setting has to be canonical and push a metaplot, then the RPG setting can be informed with those fictional elements through optional supplements that show how to use the metaplot in the game and, again, adventures as literal time-movers in RPG play. The setting can still be fixed and personal, completely customizable from its inception point on. I’ve heard a lot of fans say they’d rather have seen a reset to the gray box for fourth edition’s Forgotten Realms Campaign Setting than the Spellplague metaplot (6). However, when the aim with an IP is a series of transmedia presentations intended to create a communal experience across a wider audience, a carefully constructed metaplot needs to exist and work to reinforce aspects of a setting and story. The assumption has to be that potential fans can and will engage with discreet pieces of the IP’s available media. The metaplot then ensures the comic reader has common ground with the gamer and moviegoer, forming a community of folks who enjoy the IP from different entry points. That community also creates vectors for a consumer of one aspect of the IP to become interested in exploring the IP’s other modes. Fan investment can grow as much as the fan desires, and simultaneously increase the success of the IP. Funny enough, this series was rereleased on DVD in October of 2013. I reiterate, though, that an RPG setting is a static starting point for private storytelling (even if you stream it to an audience), and that private storytelling can be thoughtfully informed by metaplot but should not be made beholden to it. Few RPG IPs started as prepackaged stories, unlike Star Wars and Star Trek and Marvel superheroes. That fact is one reason it has been a struggle for RPG IPs (and those of other games) to expand into the transmedia space. Most RPGs started as deeply personal storytelling tools, lacking the characters and coherent story arc to support transmedia presentations. Even when a metaplot existed, as it did with the old World of Darkness, the canon wasn’t carefully used to inform new media. 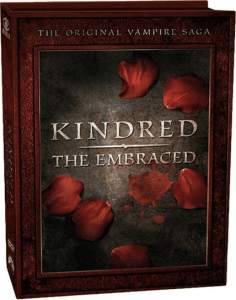 Take the Kindred: The Embraced television show, which could have heavily utilized existing metaplot but didn’t, yet still managed to be too complex for viewers outside the RPG fan base to easily comprehend. The Vampire: The Masquerade video games Redemption and Bloodlines are similarly lacking in direct metaplot tie-ins, with the cult classic Bloodlines informing White Wolf’s Time of Judgment more than the World of Darkness metaplot really informed the video game. As more existing IPs aim at transmedia implementation, from Wizards’ D&D to Paradox’s (White Wolf’s) One World of Darkness, carefully constructed metaplots (and associated characters) become more important to those properties. As I’ve said, a good metaplot is the method to expand into media beyond the games, grab a larger audience and bigger income, and morph into an entertainment brand. Those managing the transition need only recognize the differing needs of their diverse audience. The RPG folks need their platform to tell personal stories, and the wider fandom needs a superior narrative arc filled with remarkable characters to keep good stories rolling. As I illustrated earlier, the streams can cross in ways that increase the audience’s enjoyment and ability to interact with a beloved IP. When I was a kid, I enjoyed it, but it doesn’t stand the test of time. I hope these IPs make it into a widely successful transmedia space, because doing so helps to ensure their survival. They deserve to endure. Yet, in this world where entertainment is easy to come by and full of competition, a broad fan base is necessary for any of these IPs to continue to flourish. The good thing is that a thriving IP can afford to include parts, such as tabletop roleplaying games, that serve a small but highly invested part of the audience. So, ultimately, I’m expressing selfish hopefulness. I want these movies and comics and video games, all with consistent settings, enthralling characters, and interrelated story arcs, because all that stuff is awesome. But give me my tabletop RPGs, too, even though I have no illusions about their revenue potential. Put another way, healthy roots need new growth. I didn’t get the job. That honor belongs to Kamir Muammad. Novels as canon creates damage in multiple ways. Damage is done to the RPG setting because moving time forward in the setting really belongs in the interactive space of play. Damage is done to the novels because they have to conform to other novels as canon, and slip-ups that create contradictions are inevitable. If the novels didn’t have to conform, each series of novels could be a what-if scenario, just as intertwining and inspiring to the RPG, but not a point of “history” someone later has to remember. I could see a specific subset of novels being treated as canon, but only for an IP that benefits as much from novels as the RPG. 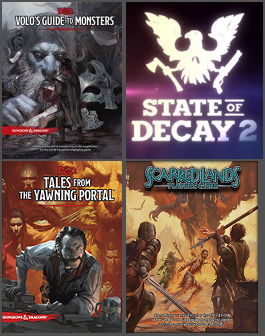 For the D&D game, the sad fact is that the novels were not in that category. The second edition of the Dark Sun setting was fine as a static picture of an Athas one could begin play in. The problem was that the setting had to conform to changes that occurred in the metaplot, so a lot of what had made Dark Sun so interesting had to be removed. That’s why the 4e setting rolls time back to before the Prism Pentad. The damage came from wrongheaded thinking that the mechanics of the game had to be explained in the story of the setting. I objected strongly to this tactic and suggested a setting reboot, which was the path ultimately and thankfully taken with the later Dark Sun setting. That said, I like the Spellplague story, and it could have made a wonderful story line for novels and optional supplemental gaming material. The nonoptional insertion of the metaplot was the problem. Interesting is that Magic: The Gathering has the opposite situation. The IP has neat characters, but its setting is so fragmented as to be confusing if presented to the uninitiated without lots of potentially off-putting exposition. It’ll be interesting to see how the story team bridges the gap to make the leap to movies, as I’m sure Hasbro would like them to do. Drizzt, for instance, as a friend of mine on the D&D story team once pointed out, is a character that requires too much explanation to acquire wider traction with a general audience. Drizzt also journaled a lot, which is hard to translate into nonwritten media. 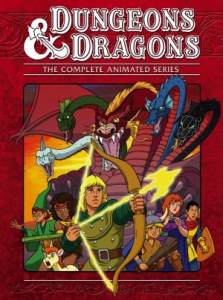 Great article, but I think you’re off base about the D&D cartoon. I’ve recently introduced my 4, 6, and 8 year olds to it. They all LOVE it. And they don’t have a large D&D investment. They’ve never played. (although I’m about to introduce my 8YO to it). The cartoon has a great premise, good animation, fun understandable characters, a broad appeal with character diversity and agency. It has good action and not unwholesome humor. It may not still appeal to YOU personally, but the target audience for kids cartoons, kids still seem to like it. I would say it has absolutely stood the test of time. I like 4e. That doesn’t mean, insofar as business, mistakes weren’t made. As for the cartoon, I probably should have said it didn’t stand the test of time for me. I think novels as canon aren’t really that problematic if the scope of your narrative is focused. The problem with Forgotten Realms canon is that it’s stories are epic in scope so that they sometimes radically alter the political and even metaphysical status quo. 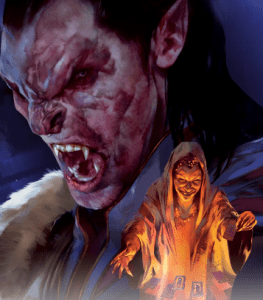 It makes sense that protagonists can do that, given D&D player characters also have access to that sort of power, but it necessitates that the novels and your individual campaigns will come into conflict. Much of the World of Darkness, however, didn’t necessitate a global scope. The system and tone of many of the games were focused for more personal narratives whose impact on the world may even go unnoticed. If the novels and other media had limited their scope to telling these sorts of stories then they probably wouldn’t have created much conflict, even for players whose campaigns expanded to a larger scale. I agree wholeheartedly. My criticism are aimed at the FR work as it exists, though. I’ll also stand by the idea that novels with small scope also don’t need to be canon. They do just fine in what-if territory. 1. Dnd is the game engine…not the settings. Mystara, forgotton realms, greyhawk…these are established settings with wizards and spaceships in the same place. Film companies want ownership of the profits. These settings (and the dnd game engine) have been greatly contributed to on a communal level (the nature of the game). Despite the HASBRO owns it faction…drizzit was created by an author who didnt create the forgotton realms setting. My own contribution to dnd by a letter to dragon magazine was the variation of magic missile into a charges energy into throwing star so my wizard dressed like ninja can get autohit with a ninja star on a paladin-cavalier in full plate armour. We now have spells that make a weapon magic for the spell duration. It is a public property despite the lawyers. 2. D&D isnt like TV or film. In D&D a party ventures into the castle ruins and the likeable thief (Shiela) trips a trap that Kills her. Episode 2: player rolls up a new thief (Silk) who is killed for selling the paladin’s warhorse to a merchant. Episode 5: Priam Agrivar the party Paladin is crushed by a Dragon and Replaced by Drizzit. This is very much a ship where as crew perish over time they are replaced until the crew have no relationship to the original crew. That is very different from lord of the rings or any Startrek tv series. An entire party could be wiped out during an ambush by kobolds in Episode 1 because chance is a nasty mother. Thats fundamental to dungeons and dragons. I disagree with both your points. Hasbro (via Wizards of the Coast) owns D&D and all official material related to it. Hasbro can make a movie set in one of D&D settings, or something called D&D but set somewhere the movie creators make up. Also, D&D isn’t just the engine, but it’s also it’s settings, and Hasbro owns all of it, notwithstanding that nuch of it has been the subject of poorly constructed licensing deals in the past. Further, not everyone plays D&D the way you suggest. Even if everyone did, a story (whether novel or movie) doesn’t have to accept that sort of play style as a parameter for telling a D&D story in another medium. Put another way, even if it is true that a play group’s characters could be wiped out in game play in the first encounter, another medium is in no way beholden to simulating that aspect of play. That’s like saying, if the medium were reversed, that a player character version of Luke Skywalker can’t die during a Star Wars RPG translation and run of A New Hope. Respecting the change in medium, Luke the player character most certainly can die. Especially given the vicissitudes of the d20, he just might. And yet drizzit is the ip contribution of R. A. Salvatore. Not Hasbro. Did he sign away ownership of drizzit come book one? Unlikely…else no book two, three, four, five… Ed Greenwood created the forgotten realms from his own game setting. Did gygax invent spell casting wizards? No. Howard had them in that first Conan. Did I surrender ownership on my ip when it came to a nifty variation on magic missile that became magic weapon spell in future game editions by sticking it in a letter to dragon magazine? Copyright law has a gray area and dnd sits in it just like all the other communal contributions and feedback loops. Dnd 5 is the culmination of decades of gray area ip appropriation. Otherwise the fighter would still be called fighting man and elves would be choosing whether to be a magicuser or a warrior each morning. I agree that many properties exist in an ethical grey area because they incorporate the intellectual creations of many other cultural entities. However, that opinion doesn’t mean they exist in any legal grey area. Legally, Hasbro, through Wizards, does own Drizzt and the Forgotten Realms. It’s right there on the copyright page of Maestro, Homecoming Book II in the form of the “(c) 2016 Wizards of the Coast, LLC” line. It’s similar, with Ed Greenwood’s latest novel in FR, The Herald, copyrighted to Wizards in 2014. It’s typical for shared-world fiction. And although I don’t have direct proof about Dragon’s editorial policy at the time you wrote your letter, and I don’t have the inclination to look into it further, I’m willing to bet the policy does state something to the effect that your letter, probably published or not, becomes property of TSR. It likely also states that you imply agreement to those terms by submitting the letter at all. That’s fairly standard, and it’s not a legal grey area either. But, like I said, perhaps we can agree it’s an ethical one.